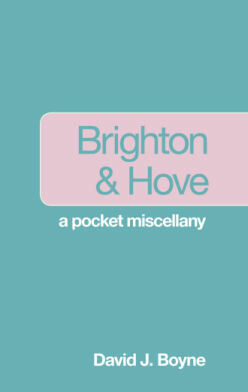 This engaging little book is packed full of insider knowledge, facts, figures and the secrets of the vibrant city of Brighton and Hove: diversity, culture, the arts, history, comedy, festival and creativity in bucket-and-spade-loads. David J. Boyne has a degree in Contemporary History and a brace of Masters degrees; one an MBA and the other in history. He is currently researching for a doctorate in Contemporary History at the University of Sussex and has lived in Brighton for 20 years. The book can be purchased directly from The History Press, from book stores in and around Brighton, such as City Books, and from online retailers such as Amazon.